Environmental success stories from around the world with their lessons on how to turn from decline to restoration and sustainability. Publication Date: November 2001, 256 pp. This chapter presents two case studies that illustrate many of the concepts in this book. The first is about eco-technology, and the second is about a regional environmental programme. I personally participated in both. Today, so many contemporary trends seem to be away from ecologically sustainable development. How can we foster sustainable development in the face of these trends? 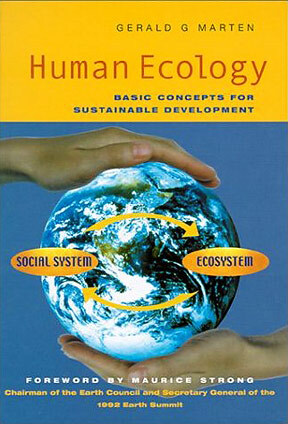 These case studies start by showing how changes in the human social system changed human - ecosystem interaction in ways that in turn have changed the ecosystem with detrimental consequences for people. Each case study then demonstrates how people can translate ecological ideas into concrete actions to move human - ecosystem interaction in a healthier and more sustainable direction. These examples show the rewards of paying attention to both ecological and social considerations in a balanced manner when dealing with environmental problems. Effective and enduring solutions to environmental problems cannot be expected when solutions focus only on political and economic considerations to the exclusion of ecological realities, or when they focus solely on ecological considerations to the exclusion of social realities. The case studies show how real people are responsible for innovative ideas and the entire process of transforming ideas to reality. Sustainable development is not something that others will do for us. It is something that together we must all do for ourselves. Dengue hemorrhagic fever is an ‘emergent’ disease known only since 1950. This case study shows how modernization can create new public health problems and how local community action with an ecological approach can contribute to sustainable solutions. Although there were outbreaks resembling dengue hemorrhagic fever in Queensland, Australia, in 1897 and in Greece in 1928, dengue hemorrhagic fever was not a recognized disease until 1956 because it was unusual to have more than one strain in the same region. Everything changed with World War II, when large numbers of people and the four dengue strains were moved around the Asian tropics. There were numerous dengue fever epidemics during the war as the virus was introduced to new areas where people lacked immunity. Cases with dengue fever symptoms appeared in Thailand in 1950. The first recognized dengue hemorrhagic fever epidemic was in the Philippines in 1956, followed by epidemics in Thailand and other parts of South-East Asia within a few years. Uncontrolled growth of developing world cities during the following decades greatly expanded Aedes aegypti’s breeding habitat. Urban landscapes provided a bounty of water storage tanks and discarded containers collecting rainwater in neighbourhoods lacking basic services such as piped water and trash collection. The decline of vegetation in urban landscapes allowed Aedes aegypti to expand through Asian cities without competition from mosquitoes such as Aedes albopictus. The social and political situation for dealing with Aedes aegypti had changed immensely since the campaigns against yellow fever earlier in the century. A few wealthier countries such as Taiwan continued to spray houses with newer insecticides, and a few countries such as Cuba and Singapore initiated comprehensive house inspections and fines to get rid of Aedes aegypti breeding around people’s homes. However, most countries lacked the political will and the financial and organizational resources to implement such programmes. Chemical larvicides that kill all the mosquito larvae, and later a microbial larvicide (Bacillus thuringiensis), were available to treat water storage containers. However, people were reluctant to put pesticides in their water. Even if people are willing, larvicides must be applied on a weekly basis to be effective. The cost of purchasing larvicides and managing large-scale use proved beyond the capacity of every government that tried to implement it. Some governments tried to organize voluntary community participation to eliminate Aedes aegypti breeding habitats - advising housewives, for example, to clean their water storage containers weekly to interrupt development of the larvae - but without much success. This was the situation about 20 years ago, when scientists in Tahiti, Colombia and Hawaii independently discovered that virtually no Aedes larvae survived in water-filled containers if the copepod Mesocyclops aspericornis was present. Copepods are tiny crustaceans that are ecologically very different from other aquatic invertebrates that prey on mosquito larvae. If mosquito larvae are numerous, the copepods eat only a small part of each larva, giving each copepod the capacity to kill 30 to 40 larvae per day, far more than they actually eat. Even more important is their large numbers. Copepods eat small animals up to twice their own size, but they also eat phytoplankton, protozoa and rotifers - a diet that provides enough food to make copepods the most abundant predator in most freshwater habitats. The total capacity of a copepod population to kill mosquito larvae is enormous. Most species of copepods are too small (0.3 - 1.2 millimetres in body length) to prey on even the smallest mosquito larvae, but Mesocyclops aspericornis and other large species of copepods (1.2 millimetres or more in body length) attack and consume newly hatched mosquito larvae without hesitation. About 10 per cent of areas with water where mosquitoes might breed have natural populations of Mesocyclops or other large copepods, which drastically reduce the survival of mosquito larvae. Another publication with this story. Estuaries are ecosystems where rivers spread out over a large area as they run into the sea. Much of the water in estuaries is a combination of fresh and salt water mixed by the ocean tides. Estuaries are exceptional in their biological diversity, their biological productivity and the economic value of their biological resources. Estuaries are also among the world’s most endangered ecosystems. Their wealth of natural resources encourages intensive use and overexploitation as well as conversion of the natural ecosystems to agricultural ecosystems. Many coastal mangrove ecosystems in South-East Asia have been converted to aquaculture ponds to satisfy the global market for shrimp, prawns and fish. Many of the world’s largest cities are located in coastal areas, where fertile floodplain soils of nearby estuaries are used to produce food for the city. It is not unusual for growing coastal cities to expand over nearby estuaries. The Barataria-Terrebonne estuary is the largest estuary in the United States. The entire estuary system covers an area of 16,835 square kilometres where the Mississippi River flows into the Gulf of Mexico (Figure 12.2). It is home to approximately 735 species of shellfish, fish, amphibians, reptiles, birds and mammals. Approximately 630,000 people live in the area, and its rich natural resources provide a livelihood to many additional people living outside the area. The Barataria-Terrebonne estuary provides an example of ecological problems that can arise when natural resources are exploited intensively and when natural ecosystems are deliberately modified or transformed to other kinds of ecosystems for human purposes. The Barataria-Terrebonne estuary case study is particularly instructive because the local people have developed a carefully designed programme of action to mobilize their community for dealing with the problems. It is a success story that illustrates adaptive development as described in Chapter 11, showing what it takes to make adaptive development a reality and what adaptive development can accomplish. Like other estuaries, the Barataria-Terrebonne estuary is a landscape mosaic that developed in response to moisture, salinity and other physical gradients extending from dry land through wetlands to open water, and from pure river water through brackish water to sea water. 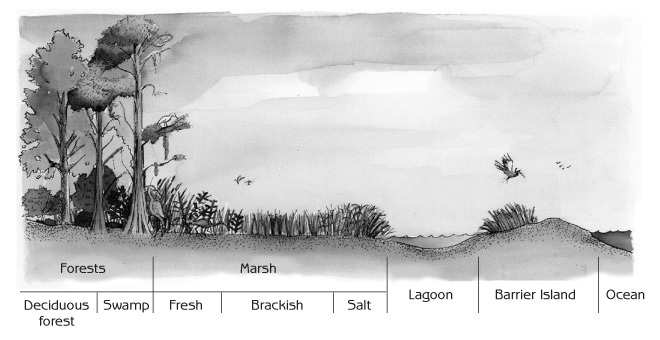 The estuary has three major types of natural ecosystems which occur along a gradient from higher to lower ground: swamp; marsh; and open water (Figure 12.3). The highest ground is dry enough for houses and farms and mixed deciduous forests characteristic of the region. Much of the higher ground is periodically flooded so that for most of the year the soil is wet or even under several centimetres of water. The natural ecosystem in this situation is swamp, a wetland forest dominated by cypress trees that can grow to a vast size during a lifetime of a thousand years. Swamp and deciduous forest ecosystems occupy 19 per cent of the estuary system. At slightly lower ground with more water, marsh ecosystems prevail, making up 22 per cent of the estuary system. Where the water is brackish or saline, marshes are typically characterized by a dense cover of coarse grasses 0.5 - 1 metre in height. Large animals in the swamps and marshes include bears, deer and alligators (which can grow to more than 4 metres in length). The open water covering the lowest ground is too deep for trees or marsh grasses to grow. Open water occupies 37 per cent of the estuary system and contains aquatic ecosystems. The estuary contains an impressive array of natural resources including timber, wildlife and seafood. It is also the nursery for numerous species of commercially important fish in the Gulf of Mexico. The integrity of natural ecosystems in the estuary is maintained by a dynamic equilibrium between sedimentation and sinking of the land. It is natural for wetland soils to sink a few centimetres each year. Because the soil has such a high organic matter content, some of the organic matter is decomposed and some is compressed by the weight of the soil above it. Sediment deposited during flooding compensates for the sinking by adding soil to the top. If there is enough sediment in the floodwater to entirely compensate for the sinking, the landscape topography and the resulting water regime of the estuary remain more or less the same from year to year. As in the rest of North America, Native Americans inhabited the Barataria-Terrebonne estuary for thousands of years. Their population was small and their demands on the estuary’s natural resources were modest. More intensive use began around 200 years ago with the arrival of European settlers who logged the cypress forests and cleared the higher (and drier) land for farming and construction of their homes. Since then, the different natural resources have been subject to intensive use at different times, as changing markets and the boom and bust of resource overexploitation and depletion have led the people in the area to switch their attention from one resource to another. Spanish moss, which hung from cypress trees in abundance, was harvested to provide stuffing for mattresses during the early years. Land was drained for commercial crops such as cotton. A prodigious supply of fish, shrimp, oysters and crawfish provided jobs for immigrant fishermen from numerous countries. Alligators were killed in large numbers for their valuable hides, and fur-bearing animals such as muskrats, mink and otter were trapped for their pelts. Nutria (coypu) were introduced from South America at the beginning of the 20th century to add a resource for the fur trade. The market for nutria pelts has declined with the anti-fur movement in recent years and, despite predation by alligators, nutria populations have exploded and seriously overgrazed marsh vegetation. Exploitation of the estuary’s natural resources changed the face of the landscape, but even greater changes resulted from developments that gained momentum during the 20th century. Most conspicuous was the network of canals constructed for navigational purposes. Intensive petroleum exploration and exploitation dating from the 1930s increased the number of canals, polluting and damaging natural ecosystems. Construction of levees and other public works for flood control completely altered the pattern of water circulation, flooding and sediment deposition that maintained natural ecosystems throughout the estuary. These changes set in motion numerous chains of effects reverberating through the estuary ecosystem. Natural ecosystems were deteriorating at an alarming rate by the 1980s. The biological resources on which so many of the estuary’s inhabitants depended for a living were seriously threatened. Some families were losing the land on which they built their homes. Change in water flow. Canals for navigation, as well as oil and gas exploration and extraction, create open channels for tidal movement of salt water further into the estuary. This salt-water intrusion increases the salinity in some parts of the estuary, changing the biological community to salt-tolerant plants and animals that previously lived only in saline areas closer to the ocean. Salinity can kill large numbers of cypress trees, particularly when salt water is carried into the estuary by powerful storm surges associated with hurricanes. Canals also increase soil loss from the estuary, as the erosion of canal banks by waves from passing boats expands the areas of open water. Material dredged to make canals is piled at the sides, obstructing water movement and causing accumulations of water in some places while preventing water and sediment from reaching other places. Flood control levees prevent river water and sediment from dispersing over the surrounding wetlands. Most of the sediment in the Mississippi River (200 million metric tons per year) is channelled through the estuary into the Gulf of Mexico. Reduction in sedimentation. The Mississippi River carries 80 per cent less sediment today than it did a century ago. Soil conservation measures throughout the Mississippi River watershed have reduced the quantity of sediment flowing into the river, and numerous water control structures along the course of the river (eg, locks and dams) reduce water flow so that most sediment settles out of the river water before it reaches the estuary. Nonetheless, the Mississippi River contains enough sediment to build land that is not isolated from the river by levees. While floodwaters deposited sediment throughout the estuary in the past, many parts of the estuary now receive no sediment input from the Mississippi River because levees prevent floodwaters from reaching reach them. Land loss and habitat changes. When natural sinking of the wetlands is not compensated by sediment deposition, the result is land subsidence. Water levels increase because lower land is covered with deeper water, and changes in water level change the entire biological community. Swamps change to marshes and marshes change to open water (see Figures 12.4 and 12.5). This land loss has been exacerbated by erosion due to wave action, human activities such as dredging and canal construction, and the global rise in sea level attributed to global warming. Most of the land loss has been from salt marsh areas (Figure 12.2), which is the wetland closest to the ocean. Land loss is particularly severe where nutria eat up all the marsh grasses, leaving almost no vegetation to hold the soil. During the 1980s, 54 square kilometres of wetland (0.8 per cent of the total wetland area in the estuary) were lost each year. The rate of land loss declined during the 1990s, in part because much of the more easily eroded land was already gone. Eutrophication. Sewage and agricultural runoff contain plant nutrients such as nitrogen, phosphorous and silicates that stimulate blooms of algae and other plants which consume large quantities of oxygen at night and eventually remove even larger quantities of oxygen from the water when they die and decompose. The effects of low oxygen concentrations in the water are particularly conspicuous when low oxygen causes a massive fish kill. Pathogen contamination. Sewage pollution contaminates the estuary with bacteria and viruses that concentrate in shellfish and other seafood, creating a health hazard for people and reducing income from these resources. Toxic substances. Although the Mississippi River arrives at the estuary after industrial and household wastes have been dumped into it along its course of more than a thousand miles, the quantity of pollution has been reduced substantially during recent decades. While the river water contains higher than acceptable levels of nitrogen and atrazine (a herbicide used in cornfields upriver), the Mississippi River is not a significant source of pollution for the estuary. Virtually all of the pollution in the estuary comes from substances spilled into the estuary itself. These include: herbicides for controlling water hyacinth and other aquatic weeds that obstruct navigation in canals; emissions from petrochemical and chemical industries along nearby portions of the Mississippi River; pollution from boats, oil spills and other pollution associated with oil and gas production; agricultural and urban runoff including agricultural pesticides, chemicals for lawns and gardens and old automobile engine oil dumped on the ground; and seepage from disposal of hazardous wastes, including heavy metals and a variety of carcinogenic organic substances. Many of these substances accumulate in the food chain, where they can present hazards to human health. Change in living resources. As the area of wetland declines, the number of plant and animal species associated with those wetland ecosystems declines correspondingly. Overexploitation and pollution can also have adverse impacts on the plants and animals. Bald eagles and brown pelicans nearly disappeared from the estuary during the 1960s because of DDT pollution from agricultural use. Populations of these two birds have recovered in recent years because DDT use stopped in the early 1970s. Introduced species of plants and animals compete with native species. Nutria consume nearly all the vegetation on about 4 square kilometres of marshland each year. In 2000, a Spartina grass die-back of unknown cause (called ‘brown marsh’) transformed about 80 square kilometres of salt marsh to mud flats and affected another 900 square kilometres of salt marsh to a lesser extent. The effects of ecological changes in the estuary on fisheries are not well understood, but some scientists think that further deterioration of the estuary could lead to a serious decline in fisheries. Despite these problems, no species of plant or animal appears to be in imminent danger of disappearing from the estuary. The Barataria-Terrebonne National Estuary Program (BTNEP) will work to develop a coalition of government, private, and commercial interests to identify problems, assess trends, design pollution control and resource management strategies, recommend corrective actions, and seek commitments for implementation. This coalition will provide the necessary leadership, will facilitate effective input from affected parties, and will guide the development of coordinated management procedures. The BTNEP will provide a forum for open discussion and cooperation by all parties that includes compromise in the best interest of natural resource protection. Obstacles to realizing the vision. Actions to realize the vision. Coalitions to implement the actions. The following description of what happened during each of these stages demonstrates how the design of a regional environment programme can evolve from broad goals, as in the mission statement above, to a specific set of actions to realize the goals. The planning process was open to anyone who wanted to participate, such as representatives from national, state and local governments, corporations and commercial organizations and interested citizens. A group of about 250 participants was continuously involved during the three years it took to formulate and refine the plan. The planning process started with a workshop to identify a vision for the future of the estuary. The key question for the workshop was ‘What do we want the Barataria-Terrebonne estuary to be like in 25 years?’ The brainstorming procedure was designed to include the diverse and often conflicting opinions of all participants while identifying broad themes on which everyone could agree. Participants put forward their ideas by writing each idea with a few key words on a piece of paper which was then stuck on a wall for everyone to see. Participants were allowed to request clarification of the meaning of a particular idea but there was no discussion of the merits of an idea. Every idea on the wall went into the final record of the workshop. Several hundred ideas were submitted. After putting all of them on the wall and making sure that everyone understood them, the workshop participants worked together to sort the ideas into groups that had something in common. All the participants then decided together on theme titles for each group of ideas. The theme titles, as well as every idea associated with each theme, were put into a word processor and printed out as a record of the workshop. The results from the workshop were summarized as a vision statement (see Box 12.1) which listed the themes identified by the workshop. Public education and informed citizen participation. Local, state and national recognition and support. Sustained and restored wetlands that support viable fish and wildlife resources. Pollution abatement to protect the health of plants, animals and people. Environmentally compatible infrastructure (roads, bridges, levees, railways, etc). Comprehensive, integrated watershed planning among all users. Harmonious use of the resources by many interests and resolution of user conflicts. We pledge to work together to develop a plan to re-establish a chemical, physical and biological balance in the Barataria-Terrebonne estuary so that diverse plant and animal communities and human health and welfare can be improved and sustained for present and future generations. The second workshop addressed obstacles and the challenges to overcome the obstacles. It followed the same procedure as the first workshop. Participants individually listed their ideas on cards that were placed on the wall. All participants then worked together to group the ideas and give theme names to the groups. The following obstacle themes and corresponding challenges are set out in Box 12.2. The challenges identified by the second workshop served as points of reference for the next workshop, which brainstormed actions to deal with the challenges. More than 400 actions were suggested, and a list of all the suggestions was circulated to workshop participants and other interested persons. The workshop results are summarized in Box 12.3. Systems related to physics, biology or chemistry and the movement of water or land within the estuarine ecosystem. Address the science and technical problems and are tightly linked to one another. Socioeconomic systems which currently have the greatest impact on the estuary. Involves informed public participation and the cultural patterns and attitudes related to economic development and natural resource value. Systems of decision-making and management which involve integrating comprehensive, holistic environmental considerations into the planning, coordinating and regulating of the human and natural resources. Systems which serve as criteria to achieving environmental sustainability. Represents how the natural, human and management systems are dynamically linked and were referred to by the stakeholders as the ‘heart or soul or conscience’ of the ecosystem. Preserve and restore the wetlands and Barrier Islands by developing aggressive and effective programmes. Promote environmentally responsible economic activities and estuarine-based jobs that sustain estuarine resources. Create an accessible, comprehensive database with interpreted information for the public. Formulate indicators of estuarine ecosystem and human health and measures of balanced use of natural resources. Realistically support diverse, common natural biological communities. Gain national recognition through informed advocacy to attract federal funding and strengthen federal policies to support the estuary. Create clear, fair, practical and enforceable regulations with balanced participatory input and interagency coordination by increasing quantity and quality of public participation. Discover common-ground solutions within management and user groups to ensure implementation and obtain voluntary protection of resources. Develop and meet water quality standards that adequately protect estuarine resources and human health. Implement comprehensive education and awareness programmes that enhance active public participation and maintain the cultural heritage. Develop and maintain multi-level, long-term comprehensive watershed planning by establishing a tradition of upfront, inclusive stakeholder involvement in all planning efforts. Be compatible with natural, physical and biological change by using existing and future infrastructures, providing harmonious, socioeconomic activities, and minimizing the impact of natural disasters. Sustained recognition and citizen involvement. The catalytic actions provided the basis for 51 action plans in the final environmental management plan. Participants who wanted to participate in implementing a particular major programme signed up as members of the alliance committed to its implementation. During the following year each alliance worked out the details of its programme. Details were planned only by the alliance committed to implementing that particular programme. At no time did anyone plan work to be done by someone else. The detailed programmes were then combined to form the environmental management plan (see Box 12.4), which was published in 1996 as a four-volume Comprehensive Conservation and Management Plan. Forge common-ground solutions to estuarine problems. Maintain multi-level, long-term, comprehensive watershed planning. Create clear, fair, practical and enforceable regulations. Preserve and restore wetlands and barrier islands. Realistically support diverse natural biological communities. Formulate indicators of estuarine health and balanced usage. Implement comprehensive education and awareness programmes that enhance public involvement and maintain cultural heritage. Create national recognition and support for the Barataria-Terrebonne estuary. Be compatible with natural processes. Promote environmentally responsible economic activities that sustain estuarine resources. Establish points-of-contact throughout the state for Comprehensive Conservation and Management Plan implementation. Maintain the programme office and critical staff. Use participatory decision-making processes at Management Conference meetings; conflict resolution. Establish two Wetlands Permitting Information Centers in the estuary. Provide education and planning assistance to local officials and planners to ensure sustainable economic development within the estuary. Develop and implement a set of recommended procedures for agencies to involve the public in the development of state rules, regulations and guidelines. Establish a periodic evaluation process to assess implementation of the wetlands permitting process and regulations. Restore the natural hydrology of areas receiving freshwater inflows. Divert freshwater and sediment to decrease salinities and maintain or create marsh. Evaluate the effectiveness of reactivating Bayou Lafourche as a distributary channel of the Mississippi River. Use dredged material to create, maintain and restore marshes. Preserve and restore the estuary’s barrier islands. Stabilize shorelines and induce sediment deposition to create, maintain and restore marshes. Evaluate marsh management and water control structures to stabilize water levels and salinity for marsh establishment and growth. Quantitatively estimate sources and loads of nutrient, bacteria and toxic contaminants within the estuary. Reduce the number, volume and impact of petroleum-related fluid spills to the estuary. Reduce human sewage discharges to the estuary from treatment plants, rural homes, unsewered communities, commercial and residential vessels and waterfront camps. Employ existing Agricultural Management Plans to reduce loadings of nutrient and toxic contaminants. Reduce pollutant loadings associated with current stormwater discharge practices; enhance wetlands with stormwater. Create a Geographic Information System-based database of sediment contamination for management purposes. Determine risks and threats of toxic and noxious phytoplankton blooms to human health and fisheries industries. Encourage landowners to manage their land as habitat for migratory and resident birds. Reduce adverse impacts of exotic plant species through regulation, education, management and control. Initiate a zebra mussel monitoring programme in the estuary and develop and disseminate new information about control techniques. Create an accessible, centralized data management system. Develop a network of community leaders and teams to support and implement Comprehensive Conservation and Management Plan Action Plans. Regularly conduct meetings to involve the public in decisions on estuary issues. Provide citizen involvement opportunities for protecting and managing the estuary. Develop citizen monitoring programmes to produce data on water quality and living resources issues. Conduct and support activities that highlight the cultural heritage of the estuary to develop environmental awareness and stewardship. Assist and encourage communities to establish urban green spaces. Continue storm drain stencilling throughout the estuary. Generate legislator support for estuary issues. Use the media for information dissemination. Organize a group of volunteer speakers and presentations on estuary issues. Provide educational materials on estuary issues for identified target audiences. Develop a targeted distribution campaign for information about the estuary and the Comprehensive Conservation and Management Plan. Create and promote the use of a toll-free number for the programme office. Develop and disseminate curriculum materials to support estuarine education (Kindergarten through university). Provide continuing environmental education programmes. Develop an awareness of the need to finance environmental education; identify funding strategies and sources. Establish an estuarine educational resources network in the estuary. Identify sources of funding for new environmentally-sustainable businesses. Encourage nature-based tourism and recreation. Develop a commercial market for nutria to reduce their impacts on wetlands. Conduct an annual technology exposition to showcase environmentally-sustainable technologies. To develop new and expand existing markets, encourage and provide training in the exportation of environmentally-sustainable resources, products and technology. Identify existing, develop new and encourage the use of more environmentally-sensitive technologies and business practices. Identify, promote and provide financial or tax incentives for environmentally-sustainable economic development. Develop and implement an education programme to explain the purpose of wetlands permitting to business and industry audiences. Implementation of the plan began in 1996. A team of volunteer participants manages each action plan. Every team is open to anyone who wants to participate. A few of the most popular teams have more than a hundred people. Each action plan is strategic in character. The team decides on activities as the work progresses. Focusing public attention on the estuary as an ecological system. Establishing credibility and trust in the programme. An image of neutrality in a complex arena of competing public and private interests is essential for acceptance by the community. BTNEP does not favour any one particular group. It is only concerned with the ecological health of the estuary. A high level of professional integrity is essential for acceptance. People who live or work in the estuary can be confident that BTNEP’s assessments and information packages are as complete and accurate as possible within the limitations of available information. BTNEP has a Data and Information Management System which draws on information from every available source, and a Sustainability Indicators Program which develops indicators to assess and communicate trends in the ecological health of the estuary. Many of the action programmes are concerned with preventing land loss in one way or another. The main thrust of on-the-ground actions to date has been the protection of land that is vulnerable to erosion by water. This includes extensive planting of mulberry, hackberry, live oak and other trees to hold the soil. In addition, brush fences have been constructed with thousands of used Christmas trees to protect the coastline from wave action. Dredged sediment has been used for small-scale marsh reconstruction. The programme’s partners have also been doing the concrete planning and other groundwork for projects to divert river water in order to carry sediment to parts of the estuary where it is needed to build land or compensate for sinking soil or land erosion. The first large-scale river water diversion is due to begin in 2001. Results will be monitored carefully to guide ongoing adjustments to details of the diversion. Monitoring will also provide information for the design of other river water diversions - some using natural water flows and others using pipelines - that are online for sediment delivery to other parts of the estuary. Many of the action programmes are also concerned with water quality. Small-scale sewage processing systems for houses and ‘camps’ (fishing cabins) scattered along the waterways in the estuary have been a high priority. In addition, some of the towns in the area have upgraded their sewage treatment facilities. High school students help to monitor levels of coliform bacteria (an indicator of human faecal contamination) in the water. An educational programme for farmers on alternative methods of controlling weeds, insects and other pests has helped them to reduce pesticide applications. The petroleum industry has upgraded equipment to reduce leaks and spills from oil platforms and pipelines. An intensive programme of education for people of all ages has been crucial for success. Curricula and educational materials have been prepared for schools, and training workshops have been conducted for teachers. The Americorps and Delta Service Corps (government programmes that employ youths for community service projects) give presentations on estuary issues in local schools. A toll-free telephone number facilitates public inquiries. About 500,000 informational materials developed by the programme have been distributed to the public, including videos, booklets, CD-ROMs and maps such as those included in this chapter. The videos explain the history of the estuary, its ecological problems and what citizens can do to contribute to its ecological health. The Aquarium of the Americas in nearby New Orleans has displays about the estuary, and a Barataria-Terrebonne Wildlife Museum has recently been completed within the estuary area. Volunteer speakers explain estuary issues to civic groups, and educational workshops are conducted for the public. Information is continually supplied to the media, and copies of newspaper articles about estuary activities are provide to state legislators on a regular basis. One of the greatest successes of the programme has been the high level of public participation. Businessmen’s groups are contributing to marsh restoration. High school students and other groups of volunteers plant trees, build brush fences with old Christmas trees and make community parks. Special community activities such as a migratory bird celebration and annual ecology festival combine fun with ecological education and awareness. Public meetings are held to discuss special problems such as fish kills due to eutrophication, and major projects such as river water diversions are discussed in public meetings before being implemented. What can we learn from the BTNEP case study? Some of the ecological problems are unique to estuaries, but many are relevant elsewhere. Many elements of the vision outlined by the first planning workshop, such as pollution abatement, sustainable resource use and comprehensive planning, are similar to desires that would be expected from people anywhere in the world. Many of the obstacles identified by the second workshop, such as conflicting agendas of different actors in the region, information gaps, an inadequately informed public, ecological limits and ineffective government, are familiar to people everywhere, and the associated challenges are correspondingly similar. One important lesson from this example is that, to be successful, regional environmental programmes need a full-time core staff, but they can be developed and implemented with modest resources. During the planning stage, BTNEP’s staff comprised seven people; now there are only five. Their main functions are organizing, interpreting and communicating information and facilitating action. The human resources and funds for all the activities in the action plans come primarily from government agencies on a scale that is hundreds of times that of the human resources and budget of the BTNEP office. Volunteers have been essential. However, a larger programme staff would be desirable. The small size of BTNEP’s staff compared to the large scale of the estuary, its ecological and social complexity and the large number of action plans that the staff are coordinating is a serious limiting factor for the programme. Openness and inclusion have been a key to BTNEP’s success. This approach may not appeal to politicians and managers seeking to retain as much control as possible for themselves, but openness and inclusion make BTNEP far more effective and enduring by drawing fully on the wisdom of the entire community and generating a broad base of community ‘ownership’ of the programme that in turn leads to a corresponding commitment to its success. Another ingredient, which goes hand in hand with openness and inclusion, is a high technical standard for assembling and communicating ecological information about the estuary. Sound decisions, and public support for successful implementation, depend on an informed community with a realistic picture of what is happening and what can be expected from proposed actions. Facilitation from outside the area played a critical role. The programme was developed in response to a request from the United States government which provided funds for both planning and implementation. Genuine community participation in the planning, which was central to a sound design and subsequent success in implementation, was facilitated by an outside non-governmental organization specializing in community organization and strategic planning. It is unusual for regional environmental programmes to develop spontaneously without outside assistance. The exceptional ecological and economic value of the Barataria-Terrebonne estuary, as well as the magnitude and serious consequences of its ecological problems and the high rate of land loss, are undoubtedly responsible for the fact that an environmental programme of this quality was developed at this particular location. However, regional environmental programmes of similar quality are needed all around the globe. In the same way that a school council or regulatory body is necessary to ensure the standard of education for the children in its area, environmental programmes like BTNEP and the Santa Monica Mountains National Recreation Area (described in Chapter 11) are needed to ensure an ecologically healthy landscape for future generations and, where necessary, to restore the landscape to ecological health. It is a responsibility that cannot be ignored - a responsibility to ourselves, to future generations and to all the other biological inhabitants with which we share this planet. ‘Environmental technology’ typically brings to mind methods, processes or equipment for reducing pollution or recycling wastes. Although pollution abatement and recycling have an essential role in sustainable development, a much broader spectrum of technologies will be necessary for sustainable development to become a reality. The story of dengue hemorrhagic fever and copepods illustrates biological control, an ecological technology that can help to deal not only with health pests but also agricultural pests. Can you think of other examples of ecological technologies (some of them very different from biological control) that can contribute to sustainable development? What role can local communities have in developing and implementing ecological technologies? Local environmental management offers numerous benefits, but powerful obstacles must be overcome to make it a reality. Think of the landscape in your area along with other aspects of your local environment. What are the problems that deserve attention from the community? The story of the Barataria-Terrebonne estuary shows how problems can be clarified to educate politicians and the general public in a way that mobilizes their support and participation for action to deal with the problems. What useful lessons did you extract from the Barataria-Terrebonne story? How do they apply to mobilizing political and public support for ecological action in your own community?